"Seaside Hideaway evokes the mood of rapture we feel at such times. This is a glorious sunset; spray from the breaking waves drenches the air with mist, and a radiant light bathes clouds and swells with its golden glow, until the eye can scarcely tell where sky ends and sea begins. The towering, wispy clouds resemble angels in the searchlight of God's grace; gulls fly up toward the heavenly light." Purchase unframed and save $250.00. 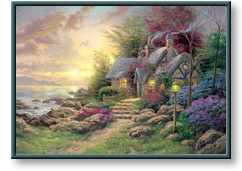 Seaside Hideaway copyright© 2003 by Thomas Kinkade is prohibited from being copied.